Insomniac has announced that Spider-Man is releasing for PlayStation 4 on September 7. This date continues to help flesh out Sony’s first-party release window, giving it a major title coming in the fall. Along with the release date, Insomniac also announced a Digital Deluxe Edition and Collector’s Edition of the game will also be coming. The Digital Deluxe Edition will include the base game and upcoming DLC for $79.99. 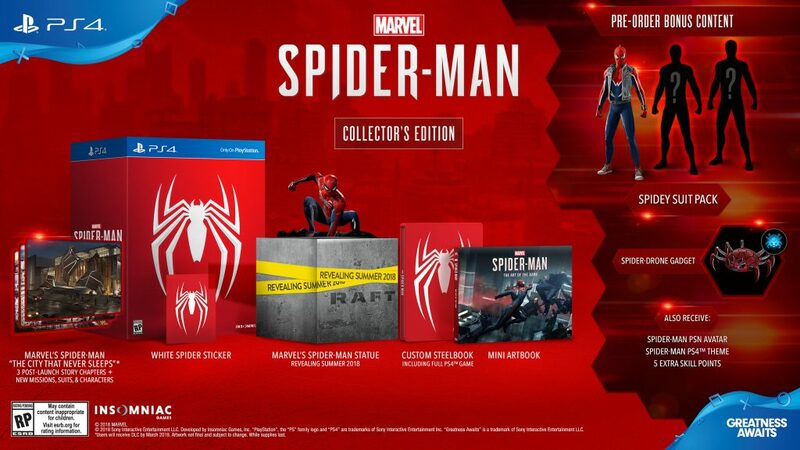 The Collector’s Edition will sell for $149.99 and include a Spider-Man statue, artbook, steel case, a PSN theme, a PSN avatar, the in-game Spidey Suit Pack, and in-game skill points for leveling up. With God of War and Detroit: Become Human coming in the next few months, it was important for Sony to have a big hitter in the fall. Spider-Man gives them exactly that. Swinging through the streets of New York City has always been a blast, and we can’t wait to see what Insomniac has in store.